After Inked is the World’s most valuable and respected brand in the tattoo & piercing, permanent makeup and medical industry! 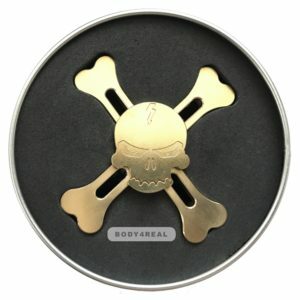 Daily skin moisturizer for new and existing tattoos. It can also be used on any permanent makeup procedure on lips, brows, eye liner, and areola, as well as an after-laser tattoo removal moisturizer lotion. We strongly recommend not combining After Inked®with any other products. 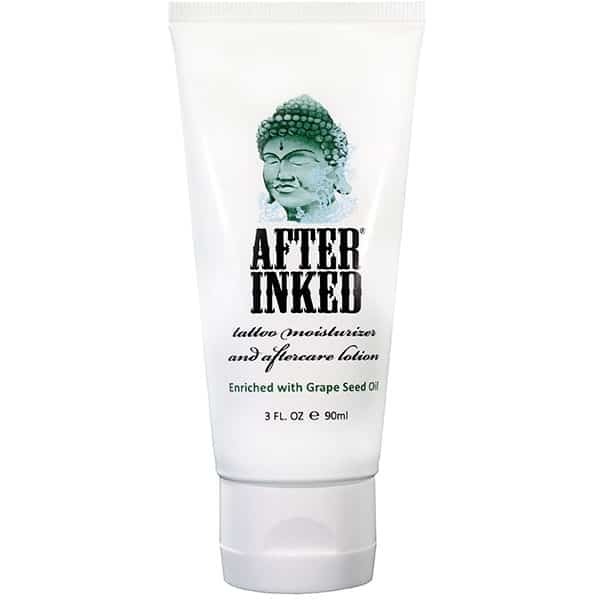 After Inked® tattoo moisturizer and aftercare lotion is all you need for new and existing tattoos from start to finish. 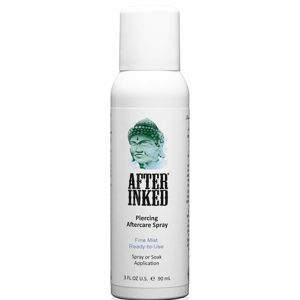 Immediately after completion of a new tattoo, apply a thin layer of After Inked® tattoo moisturizer lotion to clean hands and gently massage over entire fresh tattoo until lotion is no longer visible. A little bit goes a long way. Gently wash your new tattoo with mild soap and warm water before bedtime; lightly pat or air dry and apply a thin layer of After Inked® tattoo moisturizer lotion. Avoid unnecessary touching of your new tattoo, do not scrub or scratch it; wear clean and soft clothing; stay away from sun, sauna, steam, swimming pools or tub (do not soak it). 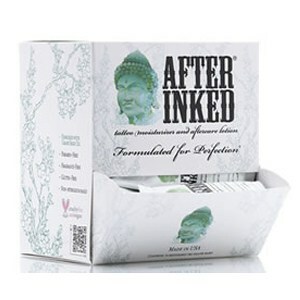 Continue using a thin layer of After Inked® every day to keep your existing tattoos vibrant. Aqua (Water): Purified water used as a “spreading agent” that helps to distribute the other ingredients evenly over the skin. Vitis Vinifera (Grape) Seed Oil: Contains vitamins E, C & Beta Carotene. It’s a very potent antioxidant. Glycerin (veg): Natural humectant and emollient. Conditions & moisturizes the skin and it can be used on even the most sensitive skin. Stearic Acid (veg): Adds lubricity to the skin making it smoother. Butyrospermum Parkii (Shea Butter): Provides improvement to dry skin. Synthetic Beeswax: Emulsifier & nourishing to skin. Alternative to animal-derived beeswax obtained from the honeycomb of virgin bees; respects lifestyle choices (Vegan). Simmondsia Chinensis (Jojoba) Seed Oil: Helps to improve dry skin. Cetyl Alcohol (veg): Natural fatty alcohol used as an emollient and stabilizing agent. It’s Halal. Citrus Aurantium Dulcis (Orange) Oil: Rich in vitamins A & C. Fresh tangy smell. Natural alternative to fragrance. Benzyl Alcohol & Dehydroacetic Acid: Preservative; natural alternative to parabens. After Inked® does not contain ingredients derived from wheat, barley, rye or oats (Gluten-Free).